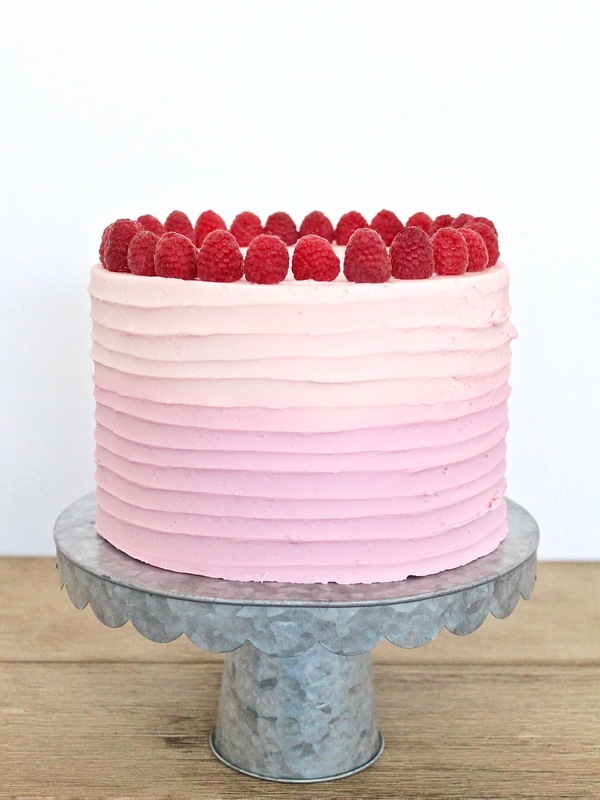 Tender pink velvet cake with raspberry buttercream and fresh raspberries. After a successful red velvet bake off last year, I thought it would be fun to do another “velvet” cake for Valentine’s this year. But, instead of red, I went with pink velvet! 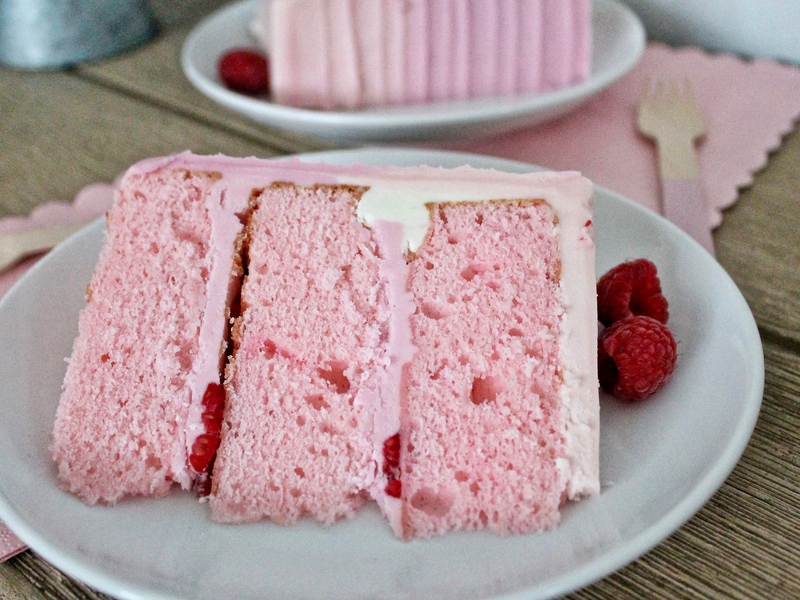 Unlike a traditional red velvet cake, however, my pink velvet cake isn’t chocolate based. Instead, I went with a vanilla based and used the idea of a “velvet” as part of the texture. I mean, look at those cake layers! So tender and velvety! The base of this cake is from my favorite vanilla cake I used in my Marshmallow Moon Cake. It’s so tender and flavorful. All I did different was add some pink food gel by Americolor. You don’t need to add much color when you use the food gels because the color is so concentrated. I only add two drops. Also, it’s super important to add the food coloring to the batter when you’re blending the butter and sugar. You run the risk of over-mixing your batter if you add the food coloring at the end. For the frosting, I thought it would be fun to do something less traditional for a “velvet” cake, which usually gets paired with a cream cheese frosting or a vanilla buttercream. I went with a raspberry buttercream, using LorAnn Oils Raspberry Emulsion. The emulsion is clear, so I added a little food coloring gel to the frosting as well. Again, just a drop or two is all you need. 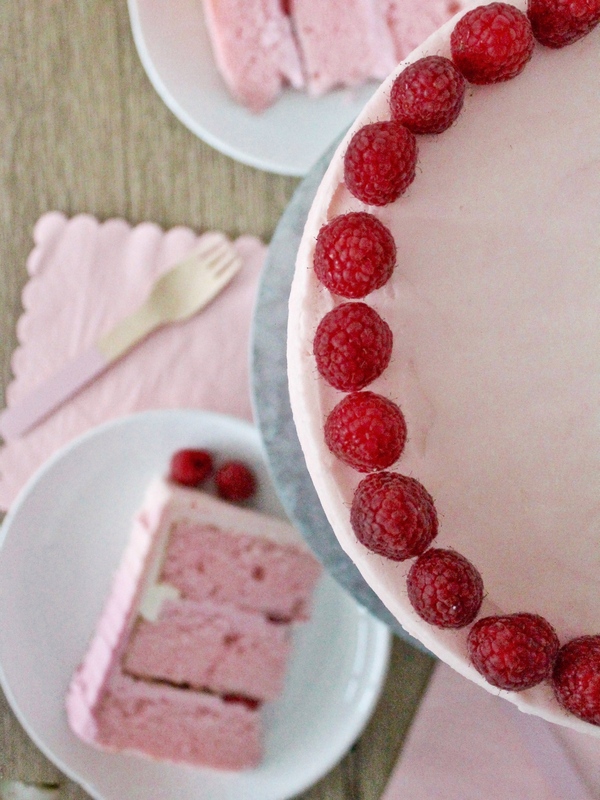 Hope you love this Pink Velvet cake as much as I do! Tender pink velvet cake layers with raspberry buttercream and fresh raspberries. Preheat the oven to 350 degrees F. Prepare three 8-inch round cake pans with non-stick spray, parchment paper rounds, and another coat of non-sick spray. Set aside. In a medium size bowl, sift the cake flour and baking powder. Set aside. In the bowl of a stand mixer, fitted with the paddle attachment, beat the butter, canola oil, salt and sugar on high until fluffy and smooth, about 5 minutes. Add two drops of the pink food gel and vanilla. Mix well. Add the egg whites, one at a time to the bowl and beat on medium until well incorporated. Turn the mixer on low and add 1/3 of the flour mixture to the butter mixture until fully incorporated. Then add half of the sour cream and blend well, followed by another 1/3 of the flour, the second half of the sour cream and the final 1/3 of flour. Mix until incorporated. Scrape down the sides of the bowl and mix on low for another 10 to 20 seconds. Pour the cake batter evenly between the three pans (about 16 to 17 ounces of batter in each pan) and bake about 23-25 minutes or until a toothpick inserted into the middle of the cake comes out clean or with just a few crumbs. Make sure not to over bake. Remove cake from the oven and let cool in the pans for 10 minutes before inverting onto cooling racks. Add the heavy cream, one tablespoon at a time. Once the cream is incorporated, add the raspberry emulsion and increase the speed to medium-high and beat the frosting for five minutes. It should get lighter in texture and color. Use a wooden spoon to mix the frosting by hand, which will push out the air pockets created by the electric mixer. Level each of the cake layers, if needed. Spread a small amount of frosting on a cake board to help hold the cake in place. Place the first cake layer, bottom-side down, in the center of the cake board. Using an offset palette knife, spread about 2/3 cup frosting evenly across the cake layer. 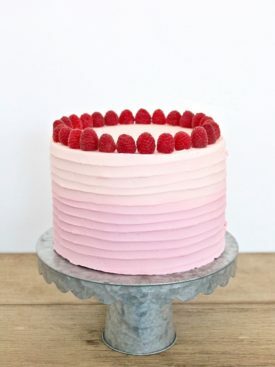 If using fresh raspberries, press about 1/2 cup raspberries into the frosting. Place the second cake layer on top of the raspberries and repeat step 2. Place the final cake layer, bottom-side up, on top of the second layer and give the cake an even crumb coat, making sure to fill in uneven areas of the cake to create an even foundation for your main frosting. Freeze the cake for 10 minutes to set the crumb coat. Continue to frost the cake after the crumb coat is set. I am so excited to try this!! Just wondering if you can make these into cupcakes! I think you can but I haven’t tried it yet. Not all cake recipes transfer well into cupcakes so I can’t be certain. Sorry! Just made this cake a few days ago for my daughter’s birthday. The cake is delicious! I was bummed because although I had planned on making a tall-ish 6″ cake, I followed the directions to use 8″ pans, which I thought would result in a cake as tall as pictured. My cake was a bit shorter after evening the layers, even with decent layers of frosting between each. So I ended up making another batch for more layers, spending twice as much time as expected on the baking. My layers appear just as thick as the photos show, so I’m super confused. Not complaining – I love the recipe, just wondering how I ended up with such a shorter cake? I don’t think I messed anything up because the texture and flavor is perfect and I’ve had a hard time finding cake recipes as good as this! So you used 8″ pans like I did? Cakes sometimes have issues rising if the baking powder or baking soda is expired, or if you overmix the batter, or if you oven temp is off. But it sounds like the texture turned out good, so I’m not sure what happened. Pingback: 6 Treats for a Seriously Sweet Mother’s Day! I live at an altitude of about 5500 feet above sea level, and I am sad to say that every cake I bake from your recipes sink in the middle. I have questioned you about this before and you have advised me that I must be over mixing. But that is not the case as I am EXTREMELY careful not to do so. Also, I am not a novice baker and have baked hundreds of cakes over the years but have lived most of my life at sea level. I will have to start amending your recipes by reducing the baking powder and sugar and adding more liquid. The sinkage is not extreme so I can make it up with the frosting and it is still very delicious, but still it really bothers me, and it is such a pain to alter the recipes. I do love your cakes, you are amazing! Darn. Sorry to hear about that. At high altitude, one of the best adjustments you can make is reducing the sugar. I would remove 1/4 cup of the sugar for it to rise better.